Photo: HIC Brand Manager, Mitch McEwen captures Jack Robinson, Australia, surfed to 1st place in his Round 2 heat with stylish and powerful tuns like this. SUNSET BEACH, Oahu, Hawaii – (Wednesday, November 1, 2017) – Vans Presents the HIC Pro, a World Surf League (WSL) Men’s Qualifying Series (QS) 3,000 event, has been called ON for today, with a new 4 to 6ft. W swell building at Sunset Beach and clean light SE offshore winds. The competition will begin at 8am HST, Round 2 will complete today along with the first 13 heats of Round 3. First in the water is Heat 12 of Round of 96 which features Manuel Selman (CHL), Kaito Kino (HAW), Cole Houshmand (USA) and Eli Olson (HAW). Top seeded surfers that will compete today include 2016 CT surfer Keanu Asing (HAW), current CT rookie Ezekiel Lau (HAW) and Maui threat Dusty Payne, among a bevvy of other international athletes like Tanner Gudauskas (USA) and Wade Carmichael (AUS). The HIC Pro is the official local qualifier into the Vans Triple Crown of Surfing and determines nine slots into event no. 1 of the series, the Hawaiian Pro, which has a holding period of November 12 – 24. Watch the broadcast LIVE on WorldSurfLeague.com, the WSL app or on VansWorldCupOfSurfing.com, or tune into Spectrum SURF Channel, which will televise the 2017 HIC Pro LIVE and in replay on digital channels 250 SD and 1250 HD, across the state of Hawaii. Maui’s Cody Young sets up with a bottom turn on an explosive wave at Sunset Beach. HALEIWA, Oahu/Hawaii (Sunday, October 29, 2017) — Recently crowned World Surf League (WSL) Hawaii/Tahiti Nui Regional Junior Champion Barron Mamiya (HAW) continues to steamroll competition this season and is onto Round Three of the Vans Presents the HIC Pro after advancing through two rounds on Day 1 of the event. A WSL Qualifying Series (QS) 3,000 event, the HIC Pro initiated the North Shore’s surf season with a solid NNW swell producing up to 10ft. wave faces at Sunset Beach. Mamiya, 17, recorded the highest single scoring ride of the day, an excellent 9.0, for two huge, committed turns off the lip on a set wave and also secured the best heat total thus far, 14.67. The teen won earlier this year at Sunset and, looking increasingly comfortable in the lineup, uses this contest as preparation for his rookie season in the upcoming Vans Triple Crown of Surfing (VTCS), which takes place November 12 – December 20. “It’s a huge event, I’ve watched it my whole life and I’ve never been in it,” Mamiya commented on the VTCS. 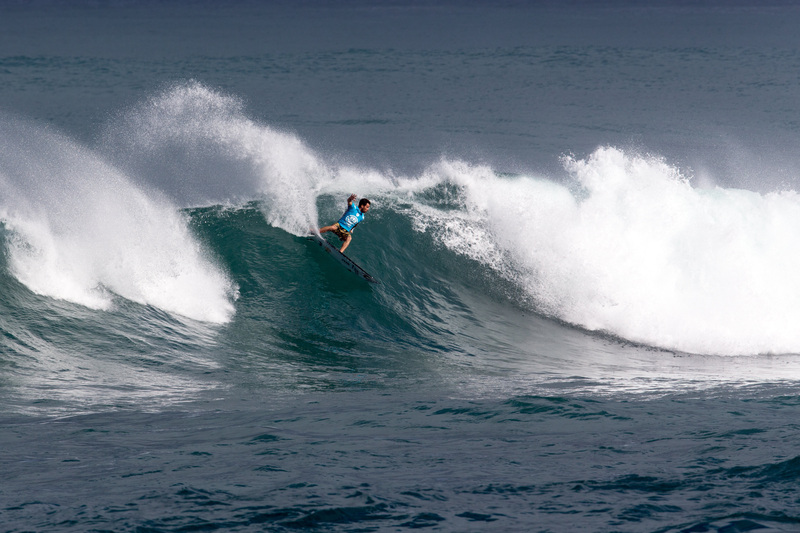 “If I can do well in that and just show people I can surf these waves, that would be huge. Fellow junior surfer Cody Young from Maui caught one of the biggest waves of the day off the point and secured an 8.33 in his Round Two heat against Imaikalani deVault (HAW), Heremoana Luciani (PYF) and Reo Inaba (JPN). Not only does Young have the advantage as a local Hawaii surfer, he also has former CT veteran Fred Patacchia (HAW)lending expertise as caddy and coach. Local favorite and defending event winner Mason Ho (HAW) squeaked through his Round Two heat by less than half a point and edged out Kauai’s Dylan Goodale (HAW) and Miguel Blanco (PRT) for a chip into Round Three. Brazil’s Jeronimo Vargas earned the heat win and was testament to the depth of talent that has traveled to Hawaii from around the world for the opportunity to gain experience on the North Shore. Kaiki Yamanaka (JPN) found a beautiful barrel in the tricky lineup in his Round One heat and tallied one of the better single wave scores of the morning, a 6.70 to advance in first with a combined heat total of 13.10. This is Yamanaka’s first competition at Sunset and only his second time visiting Hawaii, but he maintained momentum in Round Two to advance for the second time today and will surf against Griffin Colapinto (USA), David do Carmo (BRA) and Maui’s Young once competition resumes. Tahitians Taumata Puhetini and Ariihoe Tefaafana had strong performances in the opening contest of their North Shore season, both advancing into Round 3. Puhetini surfed one of the last heats of the afternoon and traded waves with big wave phenom Jack Robinson (AUS); the two advancing surfers edged Olamana Eleogram (HAW) and Kaito Ohashi (JPN) out of the event. Another standout performer was Kiron Jabour (HAW), who closed the competition for the day with an 8.50, the second highest single wave score thus far. Jabour opened with a beautiful turn and continued to rip apart the wave for a complete ride and a bid into Round Three. 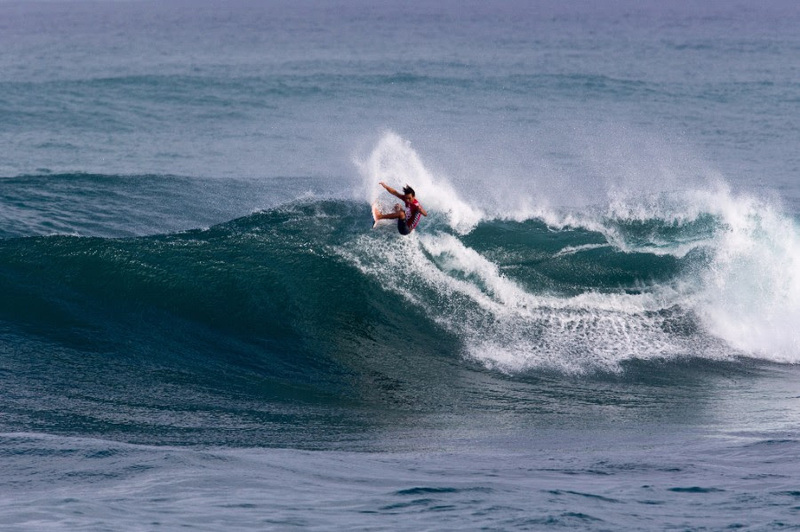 The HIC Pro completed the first of three days within the 14-day holding period today and contest organizers will convene again to assess conditions and make a call whether to resume competition tomorrow morning. For the official call and to catch the action LIVE, visit WorldSurfLeague.com, the WSL app or VansTripleCrownofSurfing.com or tune into Spectrum SURF Channel, which will televise the 2017 HIC Pro and 2017 Vans Triple Crown events LIVE and in replay on digital channels 250 SD and 1250 HD, across the state of Hawaii.